If its construction were feasible under present technology, this would be my preferred design for my own personal universal terrestrial dwelling. 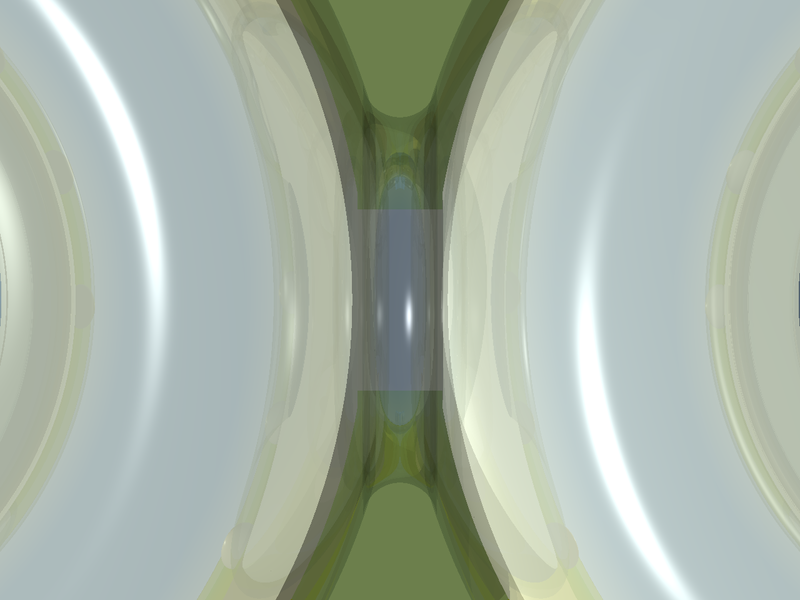 It com­prises six transparent torus shells, each containing an opaque accommod­ation unit in the form of a clipped ellipsoid. This dwelling is my favourite. From my point of view, it only has one design short­coming. It is not quite so streamlined or aerodynamic as the one I finally chose for my ideal landshare home. In consequence, it does not lend itself quite as nicely to becoming vehicular in the event that it become necessary to relocate to a different landshare. Nevertheless, as a permanent residence, I think it is the best design I have come up with. 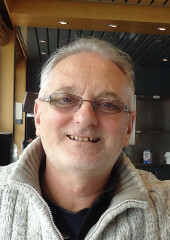 It also has a practical shortcoming in that it relies on materials which, while being possible within the laws of physics, do not yet exist (to my knowledge) as an estab­lished technology. Notwithstanding, this design has considerable advantages over the chosen design, which I shall discuss later. The basic module for this design is shown on the right. It comprises a torus outer shell with a sli­ghtly bulging inner cylinder. The outer torus shell is transparent. The inner cylindrical accommoda­tion unit is opaque but has windows where appr­opriate. A central cylinder is cut out of both com­ponents. The resulting holes - top and bottom - are capped with transparent domes (ellipsoidal caps). A couple of elliptical windows are visible in the inner accommodation unit. The lower third of the transparent torus lifts the accommodation unit above the ground providing a clear view of the horizon beyond. This fulfils one of the design ideals that the dwelling should impinge upon the Earth as little as possible. In fact, this design of module makes contact with the ground only around a narrow circle where the bottom of the torus touches the ground. In the Entrance Hall module of the dwelling, the lower trumpet of the torus houses the transparent lift shaft and helical staircase described in the article about the Clover Dwelling. A transparent door, which forms part of both the inner and outer walls of the lower part of the torus, link the staircase with the outside world. The central skylight of the module can be seen in the 45° view on the left. The sun is casting a shadow on the inner floor of the accommodation unit. The skylight itself is a transparent ellipsoidal cap, which is convex towards the sky. The corr­esponding cap at the bottom of the torus (below the internal floor of the accommodation unit) is also convex upwards. The roof space within the torus above the accommodation unit is 2½ met­res high at its circular apex. This space is ideal for installing water tanks, solar water heaters, photo-voltaic generators and radio antennas, all protected from the weather. The ratio between the diameter and height of the torus is the Golden Ratio, G = 1·6180339887. The torus is 9 metres high, giving a diameter of 14·5623058987 metres. The Golden Ratio is traditionally supposed to give a pleasing appearance to a building. The inner accommodation unit, which I referred to as a bulging cylinder is, in fact a clipped circular ellipsoid. A version of the outer torus shell, reduced to 95% its original size, is clipped by a circular ellipsoid 4 metres high and 21·843458848 met­res diameter. 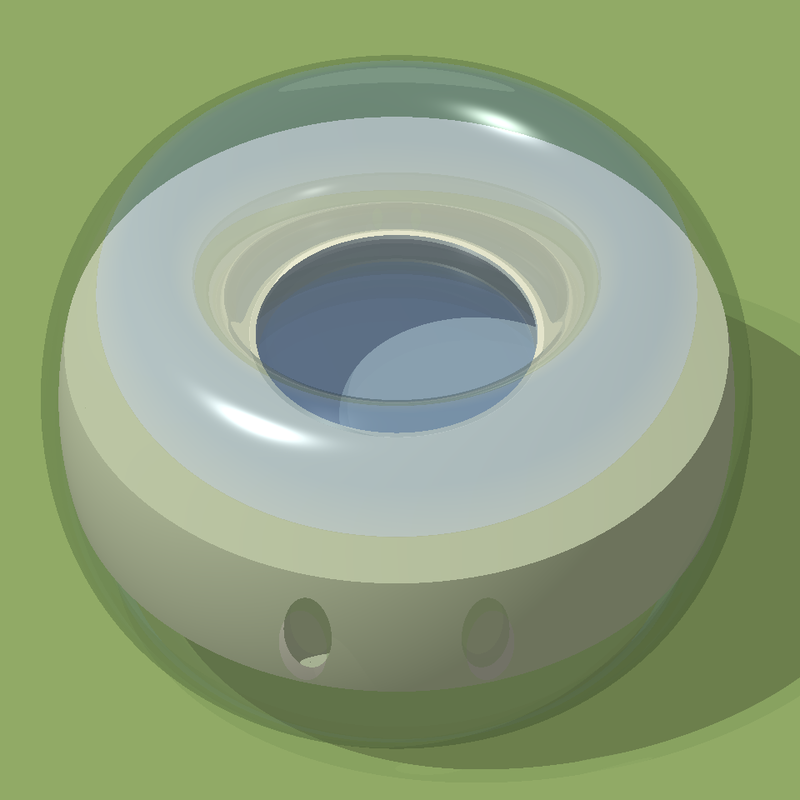 The unclipped version of the ellipsoid is then used to clip the reduced version of the torus. The two clipped objects are then merged to form the inner accommodation shell. The dwelling comprises six torus modules, arran­ged in a hexagonal plan. 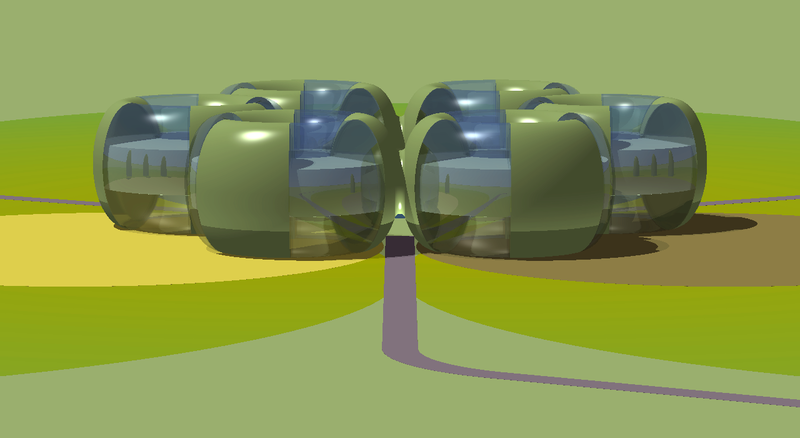 Each adjacent pair of modules is joined by a transparent connecting corridor, made from the same material as the outer torus. The corridor's geometric profile is that of a short central section of the inner double trumpet of a much smaller torus, whose cross-section is slightly elliptical. The corridor's geo­metric profile merges seamlessly with the outer torus of each dwelling module. Above is a horizontal view of a connecting corri­dor between two adjacent modules. On the left is a close-up shown from above the corridor. The corridor has a 3-metre wide floor inside, joining the floors of the two inner accommodation units. 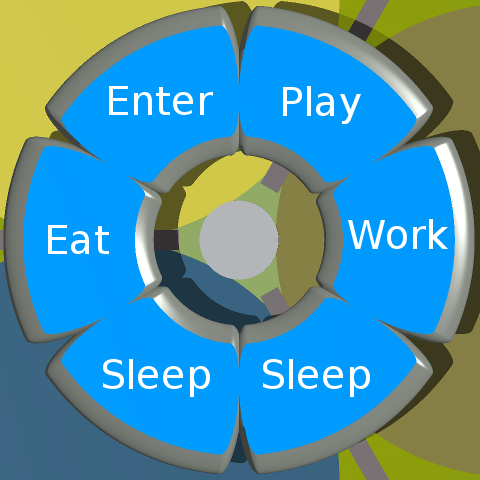 The six modules are placed in a hexagonal plan, as shown below on the left, such that, if the cor­ridors were not there, then each pair of adjacent modules would be just touching each other. Both for aesthetic appeal and to facilitate constr­uction, each module is divided into 6 flanged panels. Each flange is in the form of an elliptical cross-section of the torus. 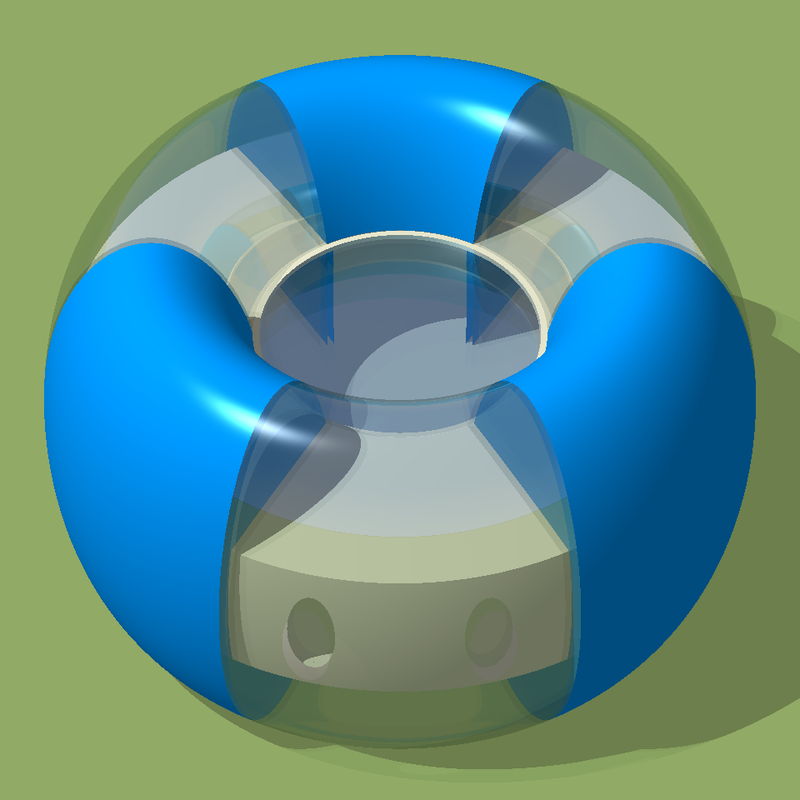 The flanges act as walls, which divide the torus into six segments, including the peripheral area within the opaque inner accommodation unit, as per the main floor plan. 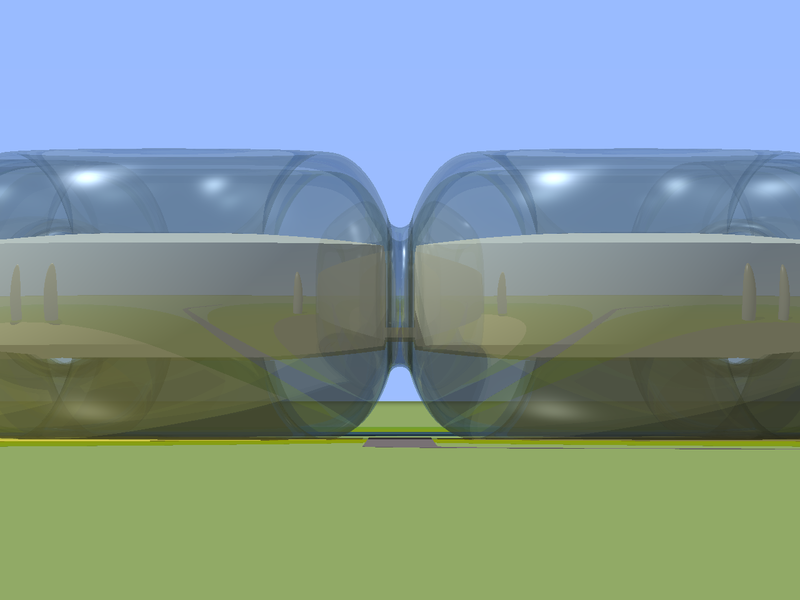 The panels, of which the torus shell is com­posed, are alternately transparent and opaque, as shown on the right. The opaque panels may be of the same transparent material, but coated on their inner surfaces with photo-voltaic cells or solar heating elements. Holes must be left or bored in appropriate places for the inlets for the circulation of filtered air and for ducts and conduits for other services, including cooling water from the lake. 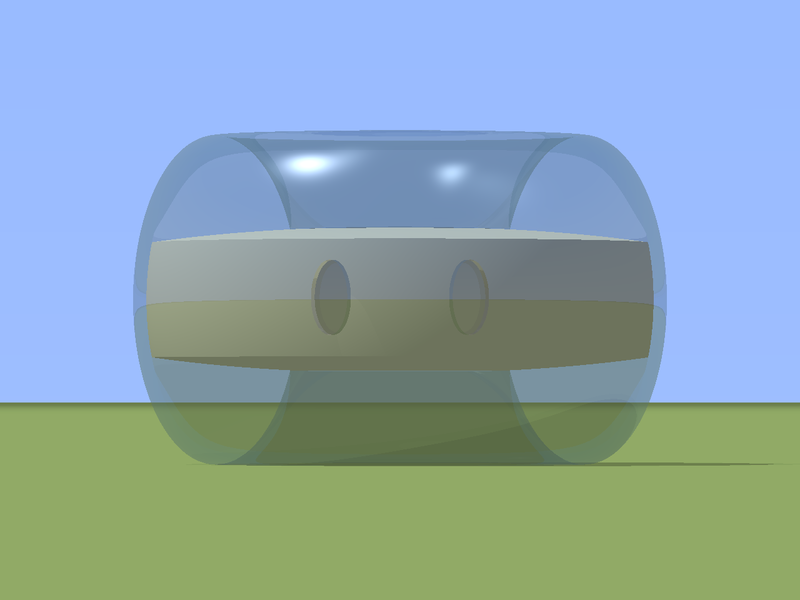 The transparent panel material of the torus shell could, of course, be tinted like blindex to soften the aggressive power of direct sunlight. The individual panels could be assembled off-site. Notwithstanding, they are still quite large. For this reason, each panel could be further divided longitudinally into 3 parts and again around the equator of the torus. Each module would thus comprise 36 panels, each of which would be a transportable size. The plan on the right shows this version of the dwelling set within the farmlet's gleba. The two hectare gleba is made up of the three green circles of land. 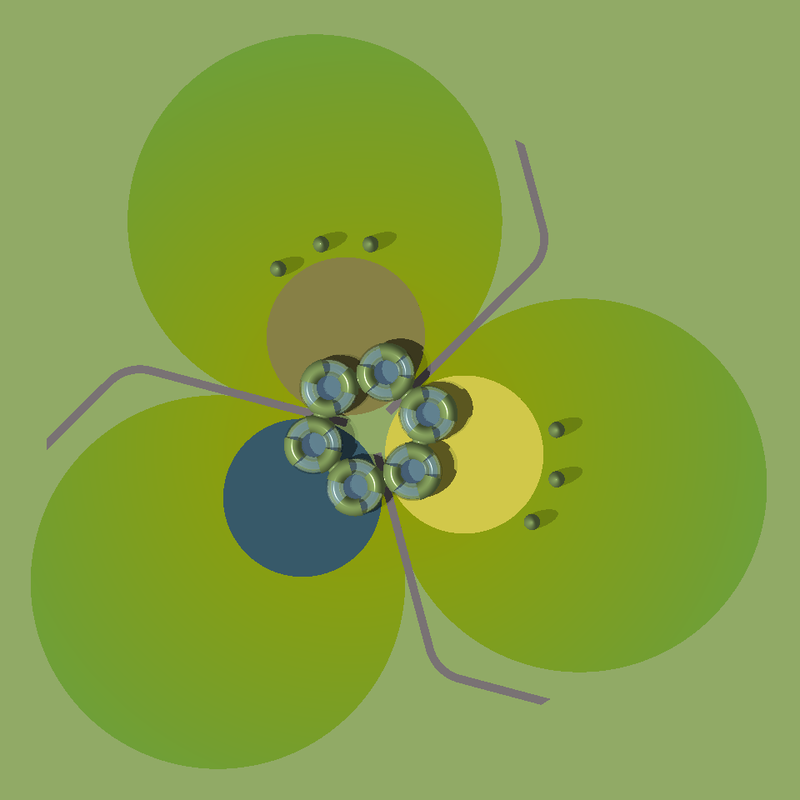 The small yellow and brown areas are crop circles and the small blue circle is the lake. The three very small circular objects just outside the crop circles are the storage and services silos. Surrounded by the six dwelling modules is the dwelling's central inner garden. The three radial brown lines are the access roads. The central circular skylight of each acco­mmodation module can be clearly seen. Click on the picture for an enlarged version. Below is an aerial view, from an elevation of 20°, of the whole gleba with this version of the dwelling, service silos, lake and crop areas in the middle. Approach to the dwelling is by way of the three radial roads, which enter the farm­let. A direct approach view is shown on the right. The road just passes through the arch formed by one of the inter-module corridors. It is not intended that vehicles should enter the inner garden, so blocking stumps are placed in the road under the entrance arch. Below is a horizontal view of the dwelling. 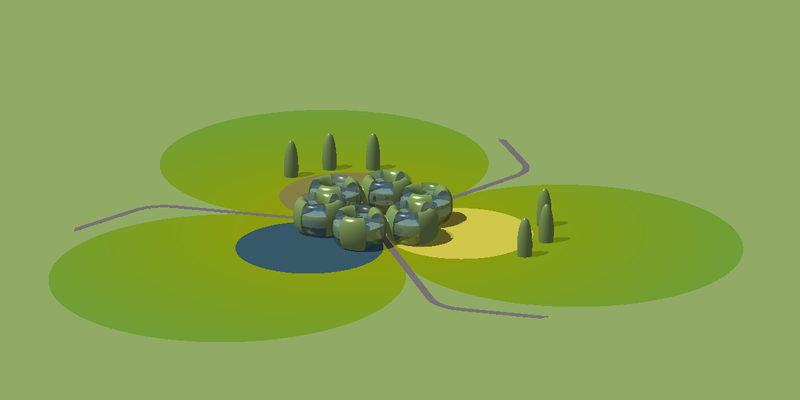 It shows side views of the connected modules of the dwelling and the service/storage silos beyond the crop circles.